The AMRC’s Advanced Structural Testing Centre in Sheffield is helping to support local innovators with global potential. Mike Excell reports. Design it, make it – and prove that it’s right. It’s a philosophy that underpins any successful manufacturing project, so when Sheffield-based steel fabricator A K Orme and Sons landed a China-bound contract to supply strengthening rings for large grinding discs, the integrity of the product had to be ensured. The rings are made by cutting steel rods to length, bending the lengths into a circle and welding the ends together, which means that the weld strength is critical. 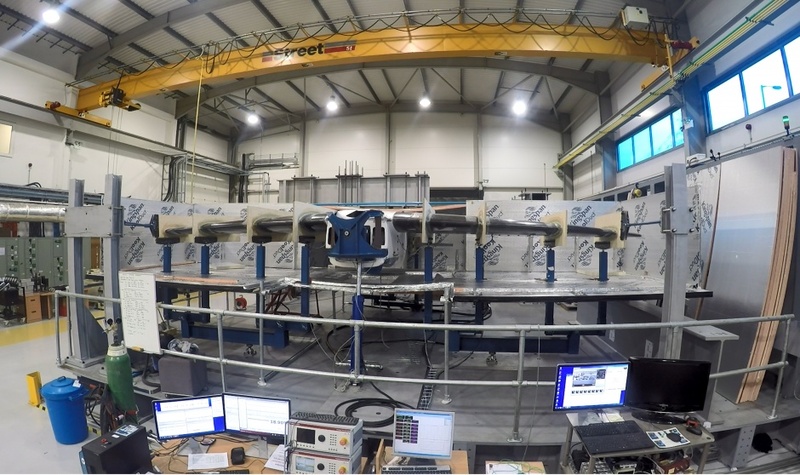 The challenge of testing these parts was presented to the Advanced Structural Testing Centre (ASTC) at the University of Sheffield Advanced Manufacturing Research Centre with Boeing (AMRC). Effective testing required cutting both welded and unwelded sections, out of the ring, and machining the sections so that the tensile strength could be measured perpendicular to the weld. Delivering tensile test pieces to meet this criterion – straight pieces, correctly orientated, cut from a curved rod – required the use of accurate polymer jigs, which were designed and produced by the AMRC’s design and prototyping centre’s additive manufacturing facility. The test pieces were machined on a two-axis lathe, and tested within the ASTC. The ASTC houses several basic machine tools for creating test pieces, and alongside the sophisticated technology that proliferates throughout the AMRC, it’s interesting to observe traditional skills being exploited in this way to create one-offs. The Orme project, directly supporting a local business, nevertheless highlights the integrated approach which characterises the AMRC – and the ASTC in particular, which is now projecting its remit across a wide range of manufacturing industry challenges. The ASTC has developed its capacity over the past decade as a resource for effectively ‘closing the loop’ on the total manufacturing process. Facilities are mainly dedicated to applying loads and pressure to parts and assemblies – as well as test ‘coupons’ – to determine fatigue life and compressive or tensile strength, and predicting how they will perform in demanding service environments. Most types of material can be tested, including composites, ceramics, rapid-prototype filled lattices, aluminium, steels and high-performance alloys. The equipment ranges from laboratory-scale impact and tensile testing machines to 2MN actuators. A 10m2 ‘strong floor’, with 1m pitch equipment locating points, allows rigs to be built to accommodate virtually any testing requirement. 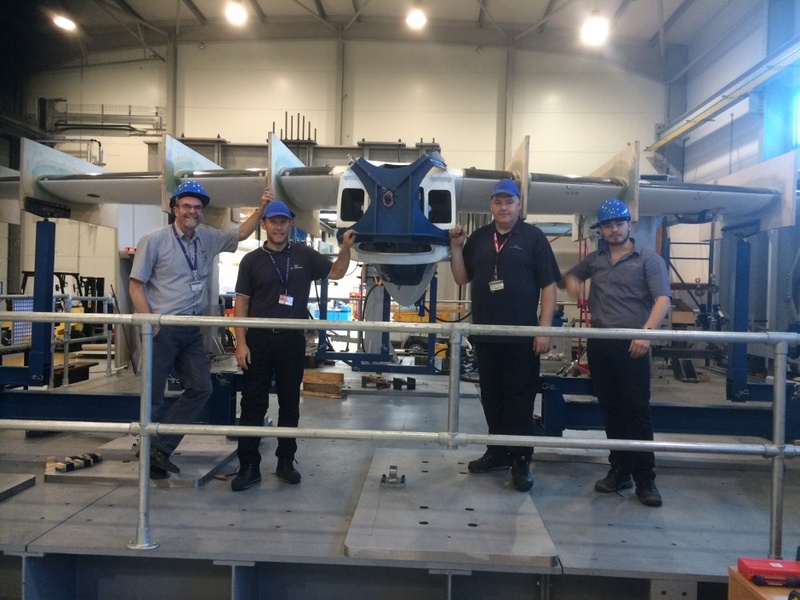 A combination of actuators and bespoke fabrications from the AMRC or local suppliers enables the ASTC to carry out tests for all industries, including the civil engineering, rail and marine sectors – and, on occasion, the aeronautics sector. 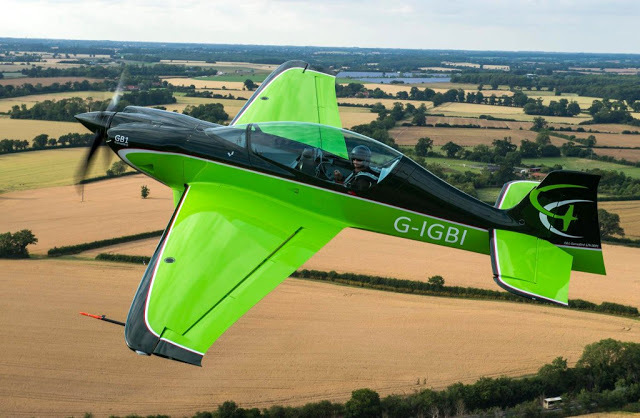 GameBird was developed by Lincolnshire-based Game Composites. The challenge for the ASTC was to build a test rig large enough to accommodate the complete aircraft; the strong floor and the space around it were key enablers. A whiffletree is used to distribute force when applying loading to test aeroplane wings and fuselages, simulating what happens in flight. Typically, load is applied from one direction at the centre, and from the other direction to the tips and other critical points. The whiffletree for the project was built by AMRC apprentices, and welding experts from the Nuclear AMRC. In this case, the process meant twisting the fuselage and the wings and monitoring 11 reaction points. The European Aviation Safety Agency was involved in observing the tests, which required the GameBird to withstand 36,000 cycles for certification; and included a load test equivalent to 10G, at 73C (the maximum operating temperature likely to be encountered – in desert regions, for example). “A complex test,” said Spiers, “and you get to know what the product should feel like and sound like as loads are applied.” Early incidents prompted some redesign of the airframe, but eventually the aircraft passed the series of tests and as such became the first fixed-wing light aircraft to be designed, built and subjected to a full airworthiness test in the UK for more than 30 years. Few of the projects undertaken by the ASTC are as spectacular as GameBird, but many have arguably more widespread and practical significance in consumer markets. For example, Leeds-based KEAH makes specialised products for the construction sector; its roof batten joint is designed to speed up a time-consuming manual job routinely carried out as a part of house-building. Horizontal roof battens normally must be trimmed to size and nailed to roofing trusses; the process is slow and wasteful, and also prone to generate weak points as a consequence of trimming, nailing, patching, splitting of batten ends and joint failure. The roof batten joint is a plastic, injection-moulded, push-fit connection, which is designed to join battens at any point along the roof structure, not just at the trusses. The task presented to the ASTC was to confirm that the joint did not in itself create a weak point. “Other test houses had quoted and were cheaper,” said Spiers. “But the team at ASTC were able to offer ideas and develop a test specification which was realistic for the application. KEAH constructed a roofing model that fits perfectly into our ‘tall rig’ ”. In terms of industries served, these two examples demonstrate the scope of the ASTC. Many of the projects undertaken support local enterprises – but this shouldn’t be surprising, since many of the UK’s most innovative companies are located in Sheffield, some in the Advanced Manufacturing Park (AMP). Runflat Systems is based a few hundred yards away; the company has developed a tyre insert that will allow vehicles with punctured and completely depressurised tyres to continue to operate effectively. The design process has been supported by Performance Engineering Solutions and additive manufacturing specialist Materialise – both of which are based at the AMP. “Runflat will do 350 miles at 55mph with all four tyres deflated,” said Spiers. The ASTC has assisted product development by carrying out controlled tests on components and assemblies that would not be possible on the test track. “We have tested the whole unit, individual pins and joints, the ‘gearbox’ (which tightens the unit), cables and the full subassembly,” said Spiers. So far, target markets are essentially military and police vehicles, but the product may ultimately find its way into road cars. A creative and flexible approach to testing is possible because not only is the ASTC accredited by UKAS, it is the only structural test facility within a UK university structural test laboratory to hold ISO 17025 ‘in-house methods’ accreditation. This gives it the licence to develop test procedures in collaboration with clients to prove out components under real-world conditions. The core philosophy, as with the AMRC in general, focuses on partnership and teamwork, and this brings knock-on benefits. For example, the 5m-high ‘tall rig’ used to test the roof batten joint was developed in collaboration with Gripple (another Sheffield company). Gripple manufactures wire joining and tensioning systems, and the rig was in fact initially designed for conducting longer and more accurate tests on longer (4m) struts produced for its seismic bracing systems. Testing projects undertaken by the ASTC range from the prosaic to the exotic; from access (‘manhole’) covers – which must withstand huge loads – in aluminium, to actuator rods for commercial aircraft assemblies, made from titanium reinforced with silicon carbide monofilaments – plus new fibre/resin combinations from the AMRC Composite Centre.